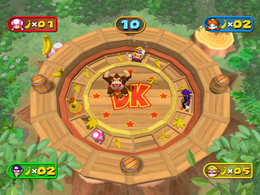 Bananas Faster is a multi-player Donkey Kong minigame in Mario Party 7. Its title is a pun on Bananas Foster, a rich dessert made from bananas and ice cream, among other ingredients. The mini-game involves a roulette-style wheel with bananas, banana bunches, and banana peels. While the wheel rotates at a great speed, the players must jump onto the wheel to collect bananas. By collecting bananas, the players' banana counts increase, which means more coins for the players after the minigame. By landing on a banana peel, the player who has landed on it will slip and fall, stunning them momentarily. Once any item has been collected, it will disappear from the wheel. Rules – "Hop on the roulette wheel to collect bananas! You can jump as many times as you want before the time runs out." Advice – "Get the bunches of bananas, but watch for the peels! If you hit one of those, you'll slip and fall." This page was last edited on February 11, 2019, at 17:54.